If you like Cottered Crank Week, you’re going to love our newest theme: One Piece Crank Week. That’s right, all the beefy boat anchors you care to view this week. Here’s our first: Ray’s Montgomery Ward Open Road Trans-Am, prepared to set sail on the ocean in the distance, yet still content keep on trolling through the neighborhood. 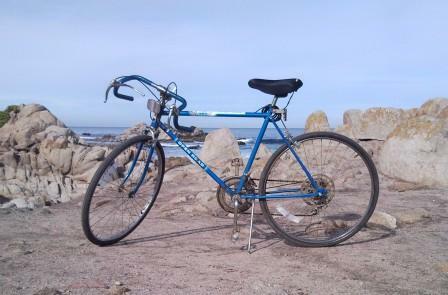 I got this bike and 6 others from the same era from a storage building just north of Salina CA. I spent the last couple of days cleaning and tweaking this blast from the past. Today we took our maiden voyage from Monterey to Pacific Grove and back. It rode like a dream…..I really think bikes have become too complicated lately. This bike is extremely simple and fun to ride. With this bike good to go I have listed it on Craigslist so I can start on the next project bike. You site is awesome….I have really enjoyed looking at all of the older bikes. Is that a Front Freewheel on that bad boy? I got the girls Trans Am bike when I turned 13 it was my first 10 speed. It was as close to having the actual car a kid could get to me. 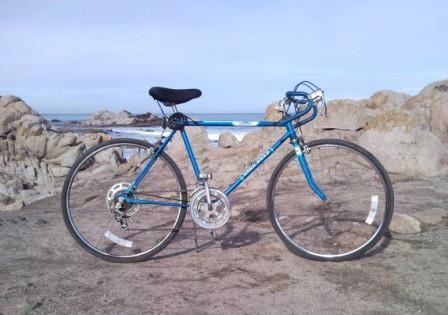 I loved that bike, I left it at my parents when got married six years later with broken brake cable. My dad took it to the dump before I could get it and fix it. I’ve NEVER seen another like it. I have one if you like to make an offer ! CALL (207)415-9808 THAT’S MY CELL AND MY LANDLINE IS (207)591-5226 ask for Sean! May be the you had still in sweet condition!